Christmas is almost here guys and how this managers to creep up on us year after year is beyond me. And if you’re anything like myself, then I’m guessing you’re also in a mad rush, feebly attempting to tie up those loose ends. Things such as wrapping Christmas presents or simply in dire need of another supermarket run (how could I have forgotten the ham?). I’ve also found myself rather stuck on ideas for Christmas treats to place around the dessert table this year. It feels like I bake the same things every year like these Rudolph caramel tarts or those beloved chocolate rum balls (but who am I kidding, rum balls are a MUST). So I’ve been trying to get a little creative this time round. 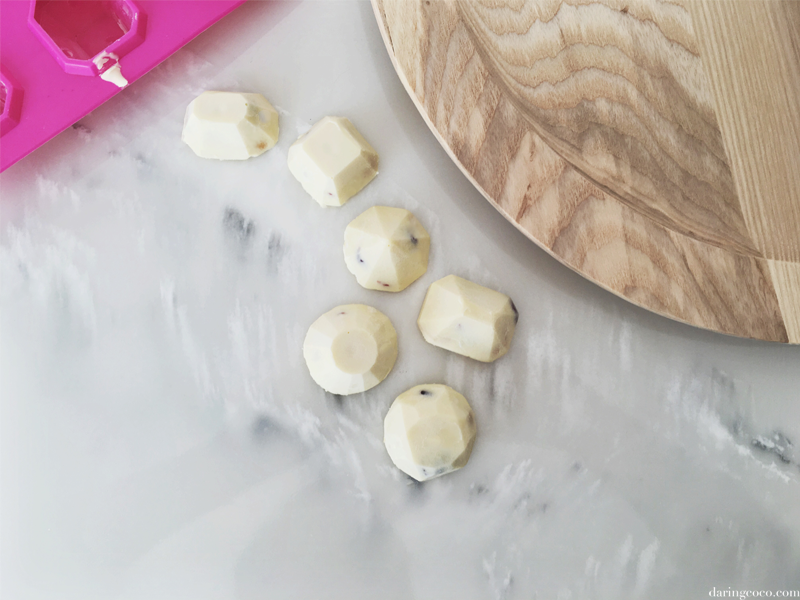 And luckily for me I had the brilliant idea of making my very own chocolates. To be honest the idea sprung forth after I found this ice cube tray from Typo stashed away in a cupboard. And since laying eyes on it I’ve been overly eager to put it to good use. I originally purchased this months ago for use during the summer months, wanting to create some Instagram-cool looking ice cubes. And maybe even filling them with fresh berries or cucumber to infuse water. Obviously I haven’t got around to doing that just yet but I will. Eventually, I think. When it comes to chocolate, who actually doesn’t like it? 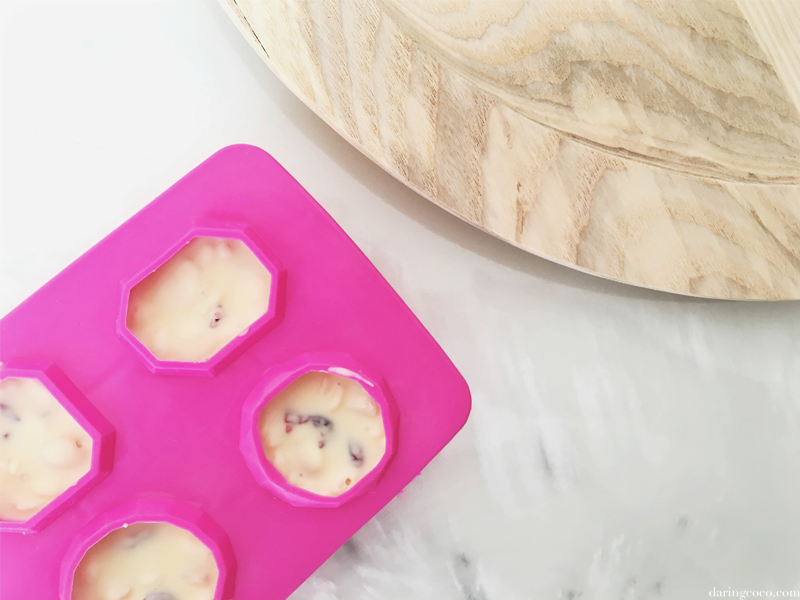 I’ve had a lustful affair with it since I was very little and after learning about chocolate moulds when I was twelve I’ve been eager to create my own. Seemingly not from scratch, but the cheats way. By melting actual chocolate and expertly pouring it expertly into moulds. It actually is. Especially if your mould is a silicon one. Those babies just pop out effortlessly. So if you’re feeling a little stuck on ideas too then why not try this little treat? These are not only perfect for the dessert table but would also make for some nice little homemade gifts for your loved ones too. 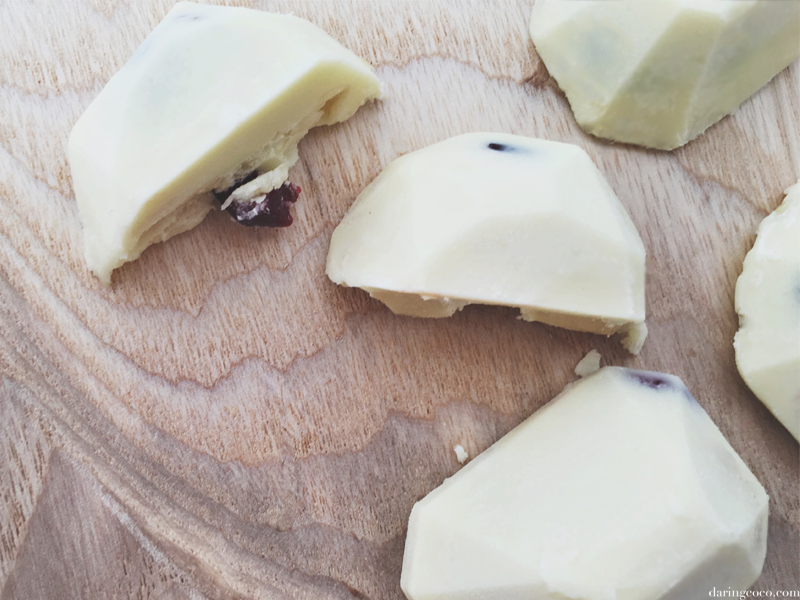 Melt chocolate in a microwave, making sure to stir at every 30 second interval. 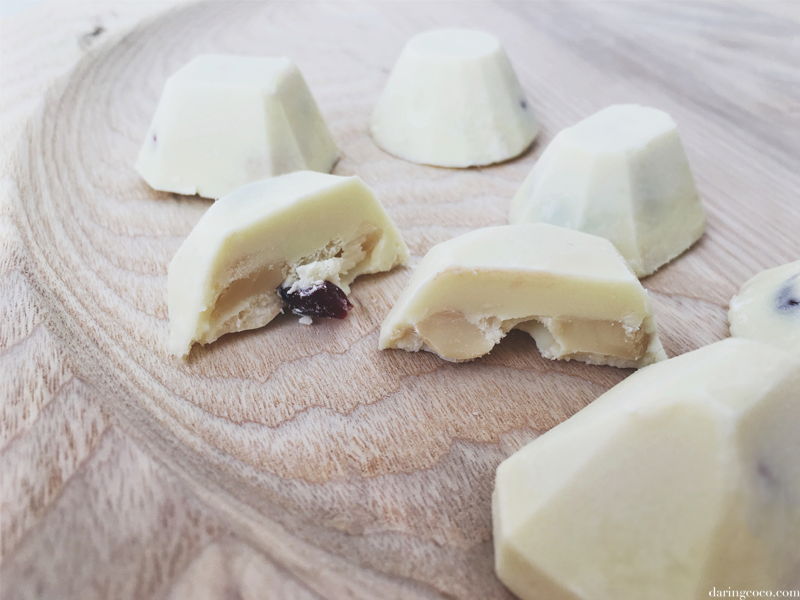 Once melted, pour chocolate about half way up moulds, then add one or two cranberries. 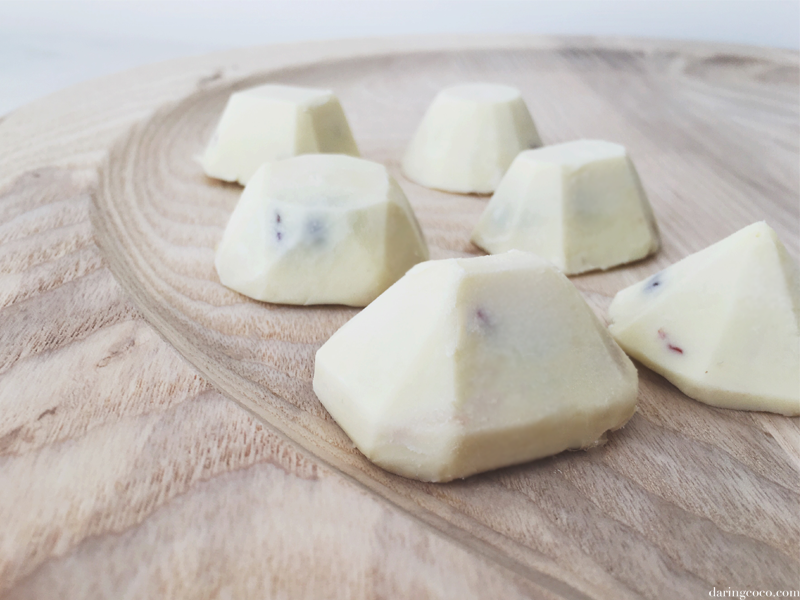 Using the tip of a spoon or a knife gently push the cranberries into the chocolate. Repeat for macadamia nuts and rice puffs. Once done, fill the rest of the mould with remaining chocolate then set aside to cool and harden.